I sent your Flat Stanley with my business partner to Chicago. I hope you are getting a lot of emails about where he has been. Flat Stanley stopped by Comiskey Park in Chicago to hang out with his pals, the world’s greatest baseball team, the Chicago White Sox. He then went to the University of Chicago where they first split the atom. A possible Flat Stanley sighting occurred at the Dekalb, Illinois toll both on Saturday night, heading west but that report is unconfirmed. Flat Stanley was only here for a short time, but we enjoyed spending time with him and showing him around Chicago. Hopefully he can come back again! 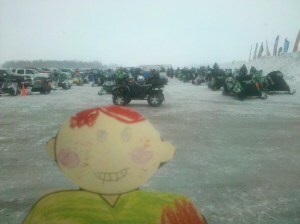 Flat Stanley went with us to Thief River Falls, Minnesota for the United States Cross Country 39th Annual Red Lake I-500 snowmobile race. The race consists of 500 miles of cross country terrain – through ditches, over road approaches, down the frozen river, and through the woods. The race takes THREE DAYS to complete. As you can see by Flat Stanley’s picture next to the truck GPS that it was rathercold up there! The truck said -16 during the day, but at night it was down to -38. Brrrr! Imagine riding a snowmobile 90 miles per hour in below zero weather! These racers are tough! 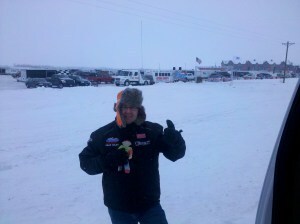 Prior to the race we went into the town of Thief River Falls to visit the snowmobile manufacturer Arctic Cat…. 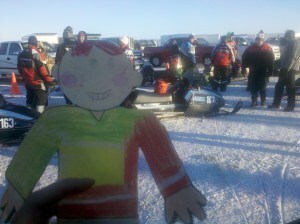 We made the visit even though Flat Stanley and his hosts are partial to Ski-Doos! The snowmobiles are impounded over night during this three day race. All of the sleds in the race were parked on the frozen pond over night. In the morning prior to the race, they line the sleds up in order of how they go off the starting line. This race is based on time, so all the sleds do not leave the starting line at the same time. They are spaced at 20 second intervals. Flat Stanley got to check out the Start/Finish Line with Track Announcer Chad Colby – as you can see Chad was dressed appropriately for the weather including a bright orange fuzzy hat! After each race day the racers have the opportunity to fix their sleds in the repair sessions. 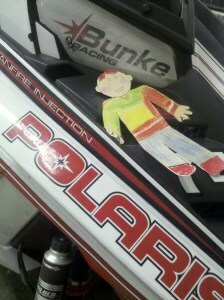 Flat Stanley got to hang out in the trailer of the #74 Bunke Racing Polaris sled team also. Here he is checking out their sled. During this year’s race there was a Vintage Snowmobile Class. These sleds were 20 years old and did not have independent suspension. No independent suspension means that they were bumpy and not comfortable to ride for long periods of time. The Vintage class had 35 sleds go off the start line, but only 8 finished the race! Many of the sleds were so old that they broke down in the rough terrain. The racers riding these sleds were SUPER TOUGH! Stanley got to check out the winning vintage sled – an Arctic Cat up close. There are also a couple of pictures with some of the Vintage sleds that finished the race. Unfortunately, the third day of the race was cancelled due to low visibility. These racers are tough, but they are also safe. It was decided that the terrain with blowing wind was just too much to handle on day 3. Prior to the ceremony Flat Stanley got a chance to check out the trophies.. and they were HUGE! The USCC Snowmobile Racing Series is sponsored by the National Guard. A few of the local National Guardsman ran in the team race during the event. Thanks for letting Stanley visit! 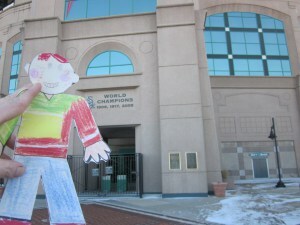 See more of Flat Stanley’s adventures! 2011 Red Lake I-500 Preview Video from USCC Racing on Vimeo. « Did I Hear You Right? Pigs Don’t Fly They Float?